It rained every day last week. The temps were lower than usual and even though Fall doesn't officially begin for another month, with the smell of gingerbread wafting through our house, it was easy to make believe that school was in session and that the leaves were turning. 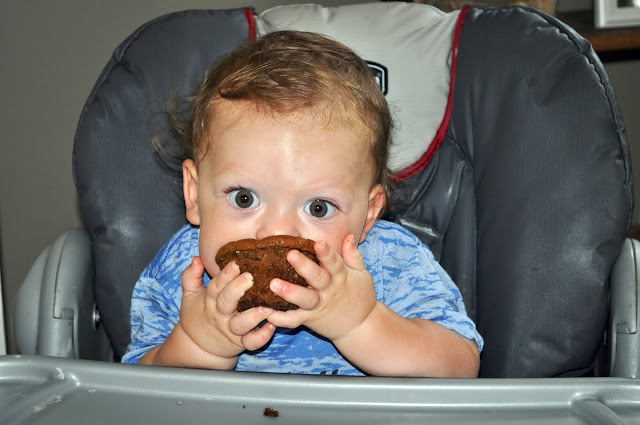 Cupcake 28 is a special little cupcake, and I picked it for a handful of reasons. Did I ever tell you that we have a tradition of baking gingerbread houses from scratch and decorating them on Christmas Eve? It's a family event. The year before Roscoe was born we made a Gingerbread Trailer Park and it was one for the books! Toward the end of every season I begin to itch for the next, so I couldn't resist a little mid-August Fall welcome. 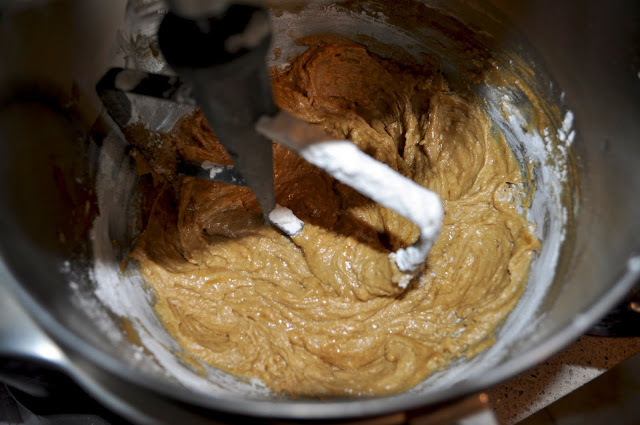 To avoid the embarrassment of discovering little lumps of salty baking soda sprinkled throughout my cuppy-cakes, I first whisked the flour and baking soda together in a small bowl. 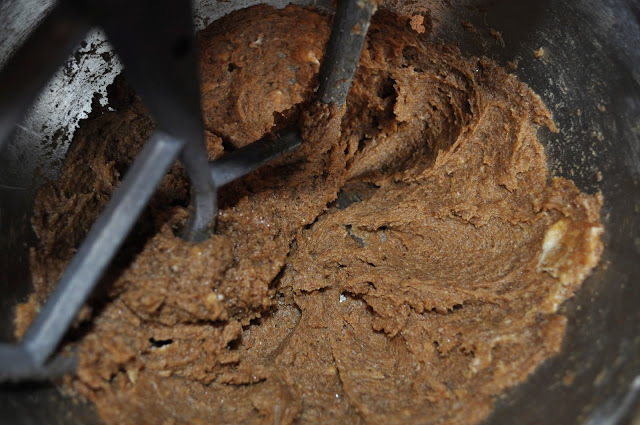 Then into my mixer I beat on medium speed the butter, brown sugar, ginger, cinnamon, nutmeg, and salt. 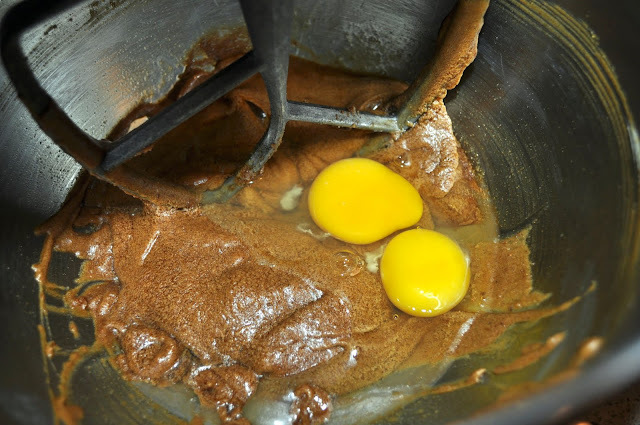 When all the ingredients had incorporated together nice and smooth I added the molasses and each egg, one at a time. Then I dumped in the sour cream, mixed some more then scraped down the sides of the bowl with a silicone spatula. 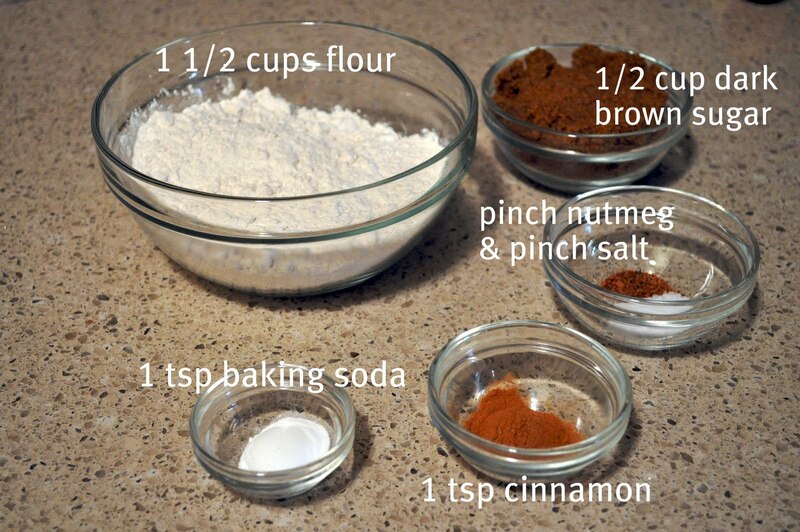 Next, in went the dry ingredients: the flour and baking soda. I dumped half in at a time and mixed the batter on medium speed until it was well-blended. Have you ever used Sili Cups? 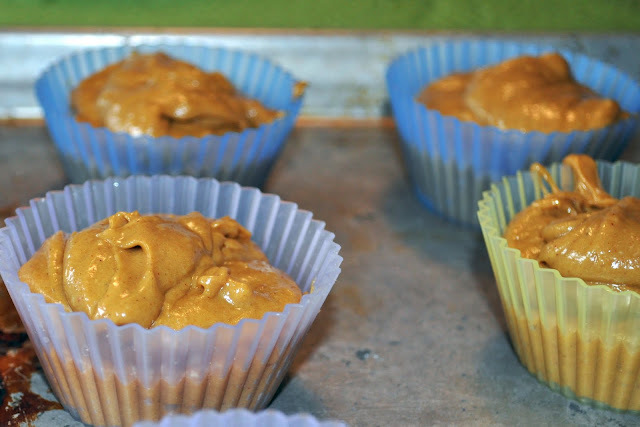 These neat little baking liners are made from silicone and are placed directly on a half or full sized baking sheet, which eliminates the need for a cupcake pan. In the face of some obvious advantages: they are pretty to look at, nonstick, reusable, portable, and easy to store, they come with an even longer list (or maybe just weightier) of disadvantages: they are a challenge to clean, often feel "sticky" even after washing, and more often than not result in destroying the delicate pastry that lies within in order to remove (at least in my experience, and maybe there's a trick I'm not aware of...but I don't think so). Anyway, I have them, so I use them! I spooned a little more than a 1/4 cup into each of 12 silicups (about 3/4 full), popped them into the oven at 350 and set my timer for 30 minutes. Then the three of us took turns with the batter bowl until it was clean and afterward we put Roscoe down for his nap. 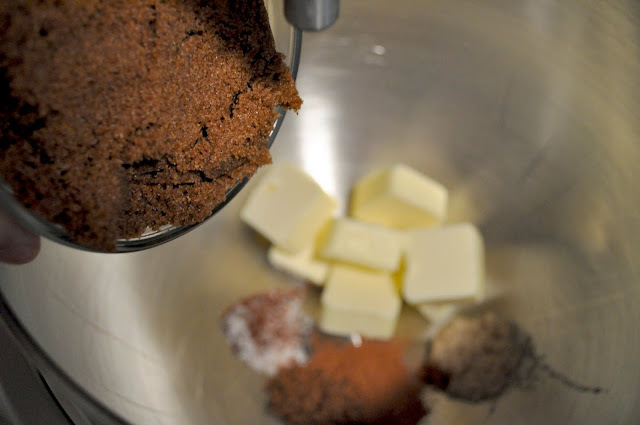 When I checked on the cupcakes at about 20 minutes they were overflowing and batter was baking into hard little brown bits on the sheet pan. Hmmm....perhaps I filled them too full. At 28 minutes a batter tester came out clean so I pulled the cupcakes out to cool. And then it was time for the FROSTING!! 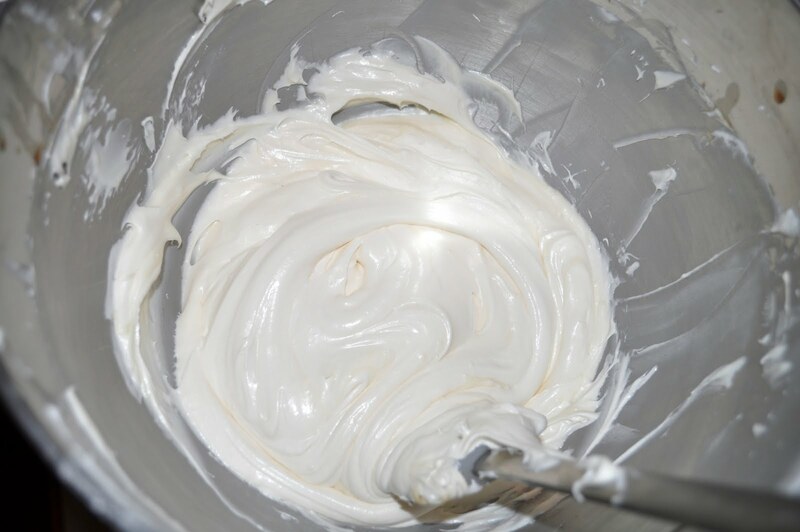 A classic Cream Cheese frosting, with a special little twist: Marshmallow fluff. 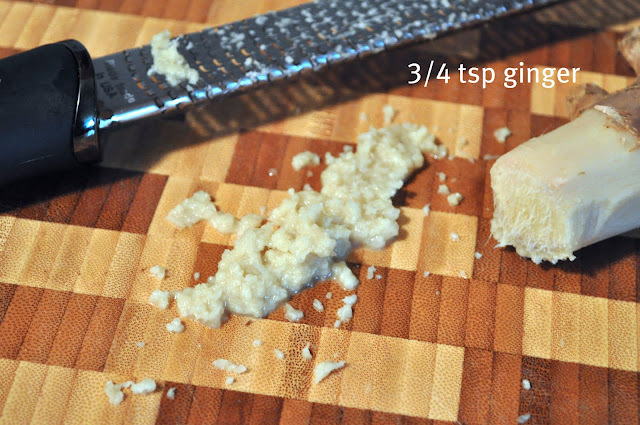 The recipe called for 4 oz. 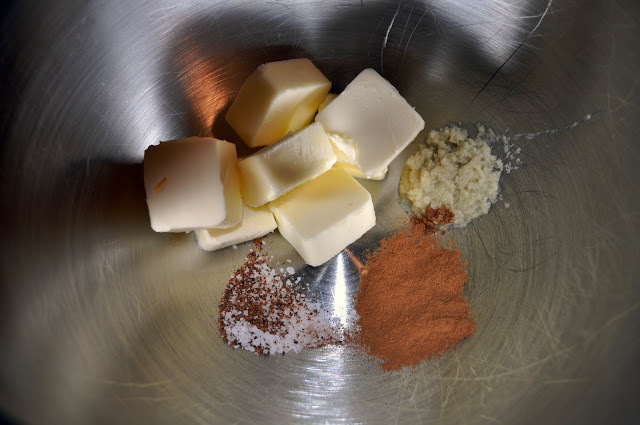 cream cheese, 1/2 stick room temperature butter, 1 1/2 cups confectioner's sugar, 1 jar of marshmallow fluff, and 1 tsp vanilla. My first concern was that the size of the marshmallow fluff jar was not specified. I had a 16 oz jar which seemed like an awfully marshmallow-heavy ratio. So I used only 1/2 the jar. I creamed the cream cheese and butter on medium high speed then added the vanilla, marshmallow fluff, and confectioner's sugar. The icing was yummy, but not very cream-cheesy and the flavor of Marshmallow was too dominant for my taste. I decided to make a separate batch of the frosting minus the marshmallow fluff, and then mix it with the first batch. Bottom line, the new ratio is: 8 oz. 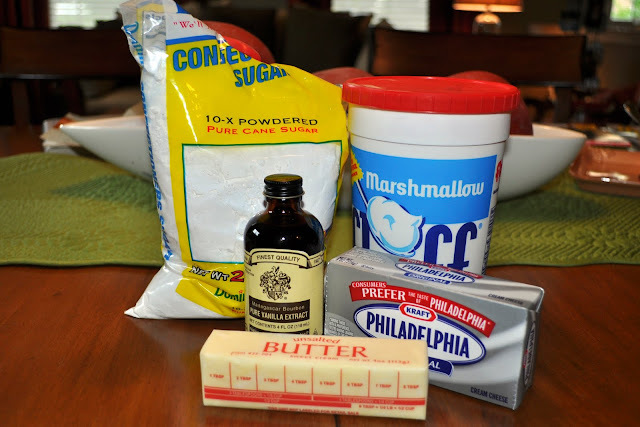 cream cheese, 1 stick butter, 3 cups confectioner's sugar, 8 oz. marshmallow fluff, 2 tsp. vanilla. PERFECTION. Luscious, dreamy, with a warm pulled taffy-like viscosity, and an egg-shell sheen finish. Delicious from beginning to end. 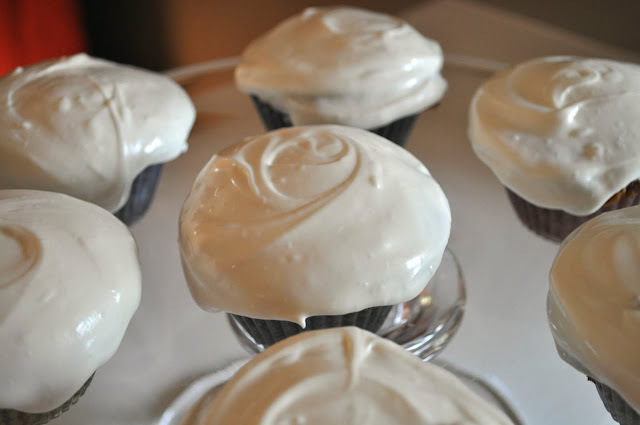 After removing the unsightly overflow (the silicups made this otherwise impossible task extra easy), I used the icing injector tip on my mechanical pastry bag to fill the cupcake centers with icing, and then I carefully iced the tops. 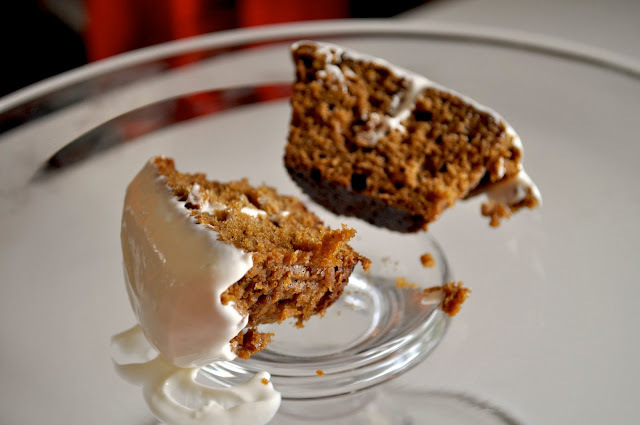 I was so happy that fresh ginger was used in this recipe, and if I could make one tiny improvement I would increase the "spiciness" of the cake. 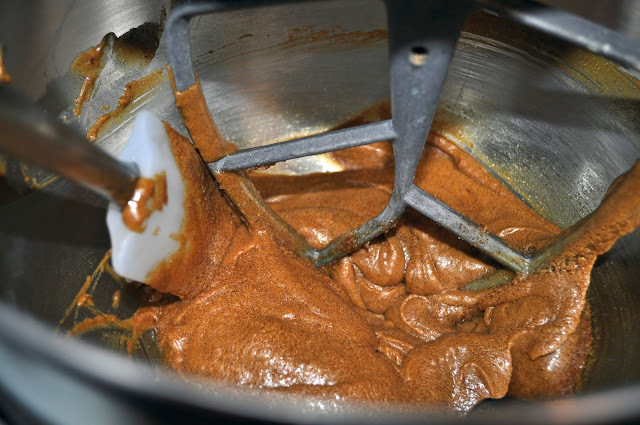 Some people don't like spicy gingerbread, but I think it would complement the cool and creamy icing so very nicely. Also, my little ginger cakes were a little dark and a little dry. Thirty minutes in the oven was too long. I think 22-25 minutes would have been better. Otherwise, my panel of taste testers declared these cupcakes "like Christmastime!" And I have to agree. 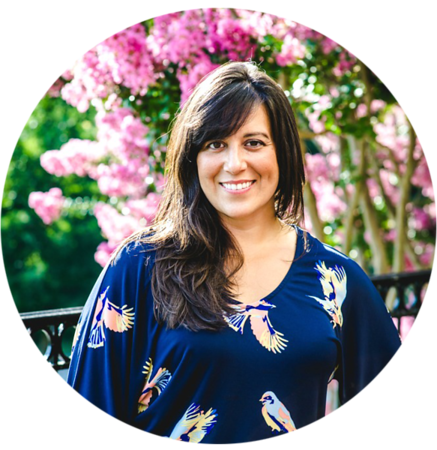 Thanks to Staci, for inventing the Bake N Blog! & thanks to Ming at Ming Makes Cupcakes for inventing Cupcake 28! Hello Cupcake twin! hehe. Your's look AMAZING! I just adore your photography - much better than mine. We don't get marshmallow fluff here, or in Australia where I am originally from, so mine were minus the fluff. Extra frosting though in the middle. yum! Skype has definitely saved our lives while I've been away, and it is such fun when everyone is chatting away in the background. Your photography is amazing! The cupcakes look delicious. So nice to "meet" you. I'm headed to check out more of your blog now! I am a fellow Bake-N-Blogger! Wow! Yours turned out amazingly! I will have to look into these Sili cups too! 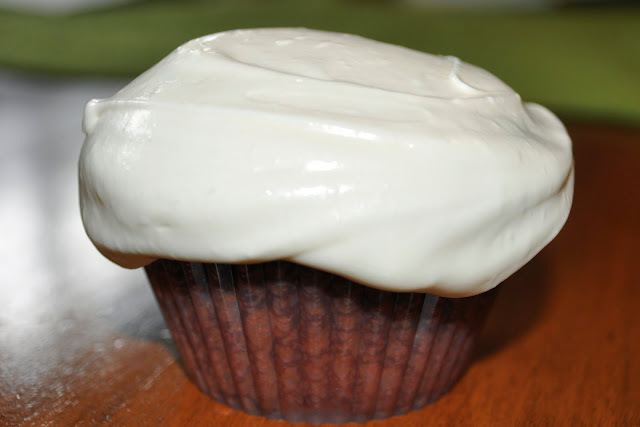 Mmmmmm, cream cheese icing is the best!! 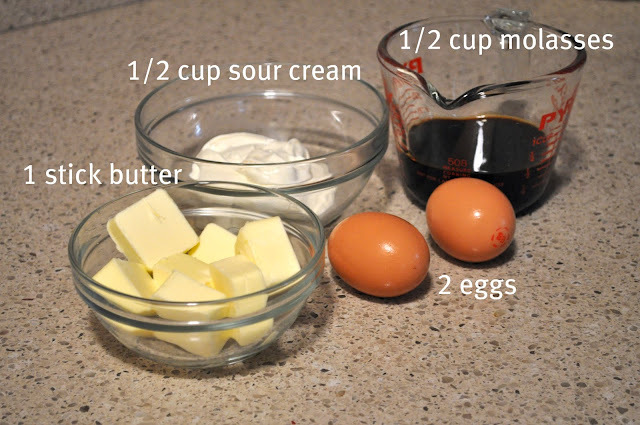 Your cupcakes look lovely, and thanks for sharing your ratios for the icing ingredients. 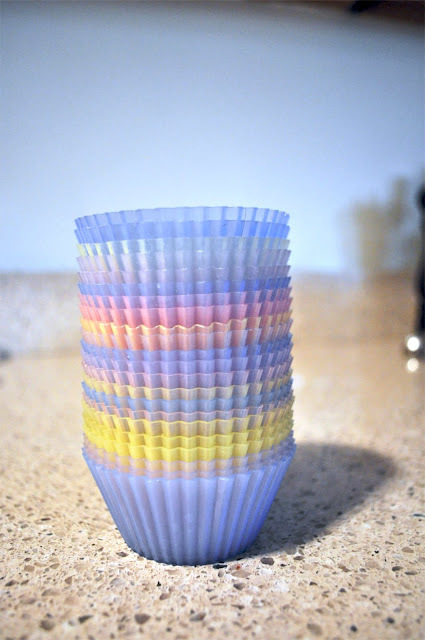 I just bought some silicone cupcake liners -- I'll let you know if I come up with any tricks to make them easier to use. they look delish! i would love it if you added your's to the MckLinky on spearmintbaby.com! They look super yummy! I love the silicone cupcake liners I have but the look different than yours so maybe that is why I don't have the same problems you have. Only down side is you can't use them in situations where you take cupcake some place as you won't always get them back! Can't wait till the day I am not always on tap and have more time to get back to baking. Oh yes Yankee!! I forgot to add that I have to chase after people as they eat their cupcakes and count and recount the silicups until I have my complete set--not the nicest task for a hostess. Taking them out of the house is even worse!! You will get back to the kitchen. I was a little worried myself, for a minute there. But for now, maybe you can enjoy other's attempts in the cooking department. Looking back, it was nice to have meals made for me! Wow...your cupcakes look amazing. We also have the tradition of making a gingerbread house on Christmas Eve! All the best!! Christine aka @GlamaMama on Twitter! Thanks Christine--it's the icing I tell you!! Oh my, they turned out great! I love gingerbread too. Thanks for sharing. I loved the back story on your cupcakes. Your photography was also great! Your little one looks like she loved them. Oh my those look so good! 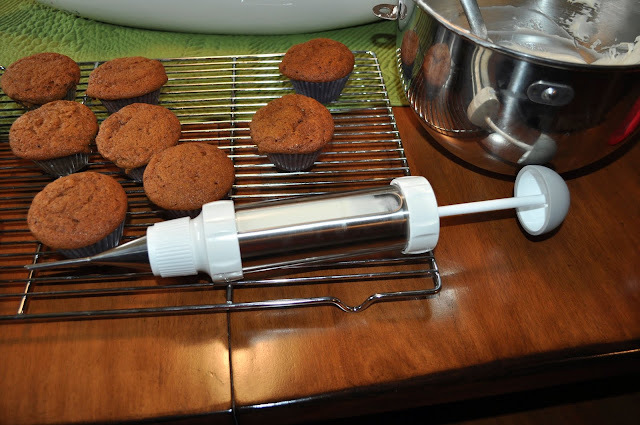 Looks like some, more than others enjoyed the process :) I need to get one of those icing injectors! 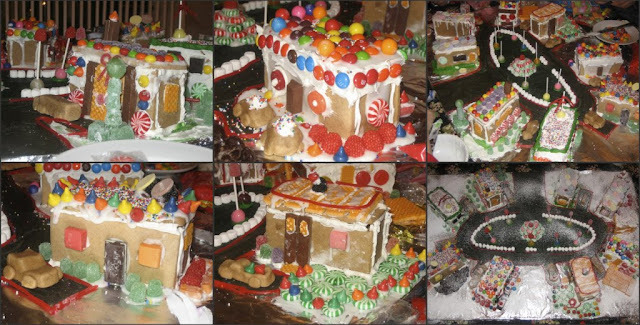 Just the sound of a Gingerbread Trailer Park makes me happy. Your photos are fantastic! Glad we were able to connect via cupcakes! 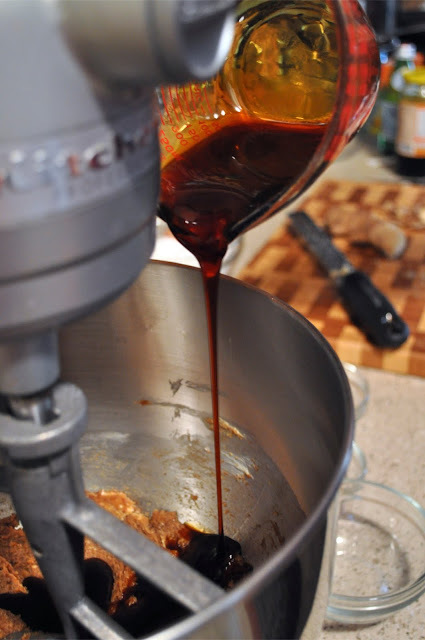 Your cupcakes look perfect and I love your thoughtful recipe edits :-). 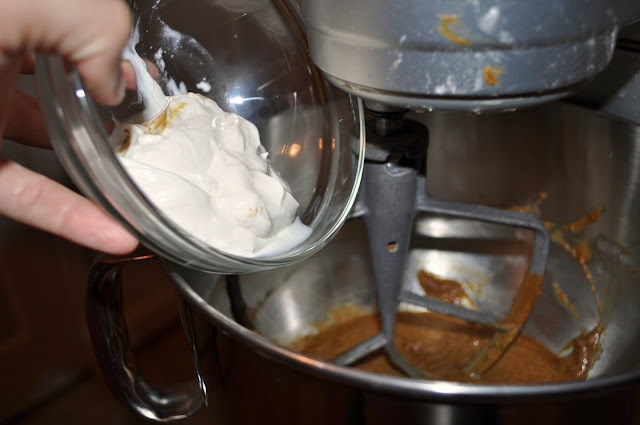 I was curious if you liked the marshmallow fluff in the frosting better than regular cream cheese frosting- which would you go with if you made them again? I'm looking forward to making them at Christmastime! Well... I'm officially hungry for sweets! I am so excited to try these Ginger Cupcakes! I want to lick that icing bowl ! They look fantastic! Glad to see that someone else piles the icing on like I do! And marshmallow fluff+cream cheese? This requires investigating! Your cupcakes look great! I think you chose a fabulous flavor to make...I think I'm going to have to try this one!